At Constantinidis & Associates, P.C., our team of seasoned trial attorneys and staff have been fighting for the rights of medical malpractice victims since our inception. We understand the emotional and financial burdens birth injuries can create for families and we are passionate about guiding our clients through the legal channels needed to secure the justice and just compensation they deserve. Unfortunately, a physician’s negligence can result in a life sentence of difficulty for you and your child. The emotional and financial burdens that victims of malpractice and their families might face can be substantial. Quite often, victims of Erb’s palsy/brachial plexus injury require lifelong medical care, nursing care, special needs accommodations, housing disability, transportation, special education, medicines, medical equipment, special caregivers and aides. That is why if you suspect that your child’s Erb’s palsy was caused by a physician’s or nurse’s negligence, it is important that you speak with one of Constantinidis & Associate's Erb’s palsy injury lawyers about your right to compensation. We will hold those responsible accountable and will fight to get you the compensation you deserve. Erb’s Palsy is a paralysis or weakness of an infant’s arm caused by injury to the brachial plexus, the nerves that provide feeling and movement to the fingers, hands and arms. Infants who sustain this birth injury many need physical therapy or surgery and may be permanently disabled for life. In very severe cases, the child will have complete lack of use of the arm, the limb will undergo atrophy and will hang inward all their life. Erb’s Palsy is usually the result of injury at birth caused when the infants delivery is not properly managed by the doctor or midwife. It occurs when an infant’s shoulder becomes stuck on the mother’s pelvic bone during delivery. Unfortunately, the doctor or midwife has failed to anticipate this and begins to exert too much force on the baby during delivery. This often occurs when there is either a prolonged labor, a breech presentation, a large baby, the use of vacuum-forceps, forceps or the use of other instruments during labor and delivery. Neuroma: A tearing and then healing of the nerve, which creates scar tissue. Neuropraxia: A stretching of the nerve. 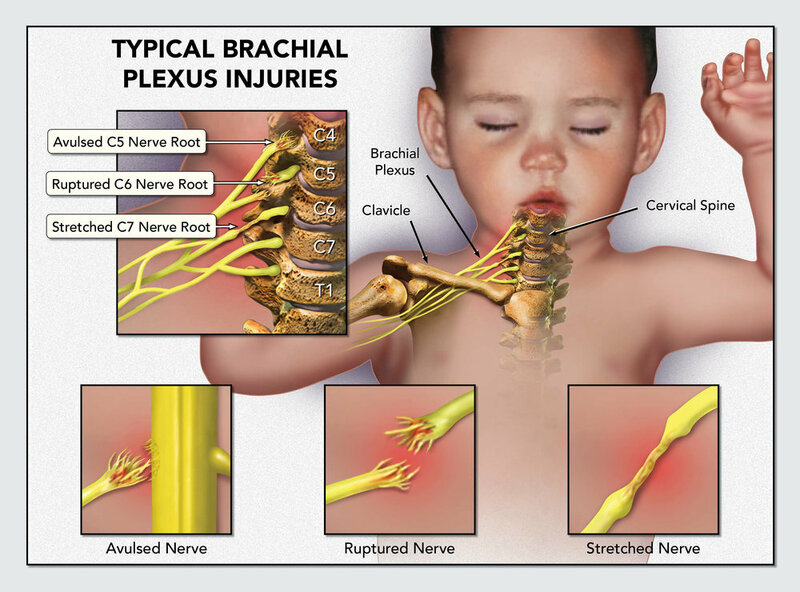 This is the most common type of brachial plexus injury. Avulsion: A complete tearing of the nerve from the spine, the most severe type of injury. If you suspect or have been told that your child has Erb’s Palsy it is imperative that you IMMEDIATELY have your child examined by a pediatric neurologist. A pediatric neurologist will be able to run the appropriate tests, render a diagnosis and recommend the necessary treatment for your child. Having a child with Erb’s Palsy is a tremendous undertaking that can result in a serious hardship for your child and your family. Likely, your child will need to receive continuous special physical and occupational therapy together with adaptive equipment as well.